Keeping the Christmas Spirit Alive 365: Decorating with wreaths: ideas for Christmas and beyond! Decorating with wreaths: ideas for Christmas and beyond! A wreath is an assortment of flowers, leaves, fruits, twigs (or any other materials around the place!) constructed to resemble a ring. We see them as christmas decorations each year but the history behind wreaths dates back thousands of years and much of the symbolism lies with Greek mythology. In the Greco-Roman world, wreaths were used as an adornment to represent a person’s occupation, rank and status. The use of the laurel wreath arose from the Greek myth involving Apollo, Zeus’ son and the god of life and light, who fell in love with the nymph Daphne. When he pursued her she fled and asked the river god Peneus to help her, in which Peneus turned her into a laurel tree. From that day forth, Apollo wore a wreath of laurel on his head. This became associated with what Apollo embodied; victory, achievement and status and would later become one of the most commonly used symbols to address achievement throughout Greece and Rome. Since then, the meaning and representation has taken on differing views, depending on the culture. In Christianity, wreaths are used during Advent. 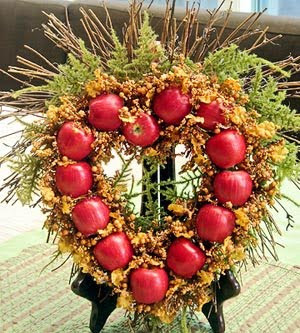 The first known association with these now modern day wreaths dates back to the Lutherans in Germany in the 16th century. In 1839, Johann Hinrich Wichern used a wreath made from a cart wheel to educate children about the meaning and purpose of Christmas, as well as to help them count its approach. 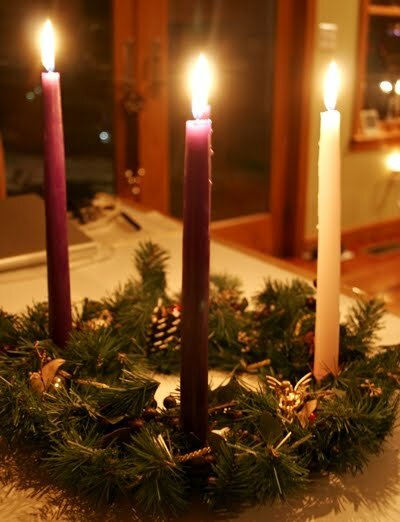 The Advent wreath is constructed of evergreens to represent everlasting life brought through Jesus and the circular shape of the wreath represents God, with no beginning and no end. Wreaths aren't just for Christmastime, though. Why not welcome a new season with a freshly decorated entrance way and front door. Fasten any wreath with a bow and some seasonal symbols and voila, you have a stylish decoration that can change for the seasons! Highlight it in an empty vintage or new picture frame. Why not use wreaths to decorate your shelves. Add jewel-toned ornaments, fresh foliage from the garden, vintage books, crockery or other trinkets for finishing touches. This wreath from Canadian Living is made with a beautiful white yarn and soft yellow banding. 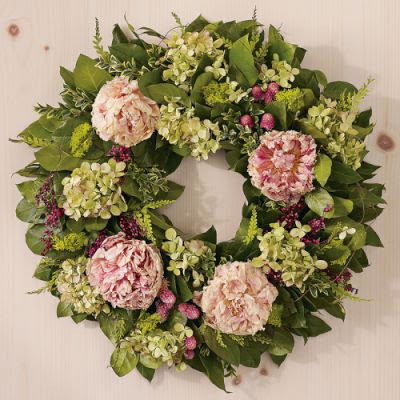 Williams Sonoma have some gorgeous wreaths to welcome Spring! I love this Lemon and Bay Leaf Wreath! Doesn't this handmade Culinary wreath look delicious with those cherry peppers, sage, safflower, bay leaves, red chilies and purple oregano! House to Home UK have instructions on how to make this yummy culinary wreath here. Pottery Barn this cute Aviary door wreath hanger to hang your wreath on! Maybe I could make one of these Autumn wreaths from Martha. I can turn an old book into a gorgeous decoration! Well, it looks like any time is a nice time to hang a wreath! They are all gorgeous. I really love the lavender wreath. Natasha, thanks for the inspiration! I am looking for an everyday wreath for my front door...too many to choose from! Oh Natasha, I really enjoyed this post of the history of the wreath, especially the greek mythology. The pictures were absolutely beautiful!! I found myself oooing and awwwwwing! LOL! I will check it out again! Thanks! I never realized that wreaths could be so beautiful. Hi Natasha, just love them all but the lavender is my favorite! Thanks for the wonderful post. what a collection of inspiration you've gathered! that peonie wreath is gorgeous! 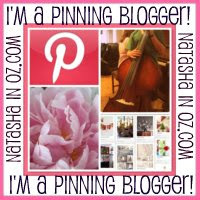 thanks for linking up to the FLING! I love to decorate with a wreath, especially love the one with the nest, thanks for linking up with VIF. Hmmmm, I think I need to make wreath for the doors of my recently finished china cabinet. You certainly show a nice array, I like smaller ones but they are all wonderful...and yes, year 'round appropriate. Thank you for all this wonderful eye candy! The garlands are spectacular. Inspiring! They are all so lovely, but the floral wreaths are my favorite! This is just gorgeous wreath eye candy! I had to look at House to Home UK. I had never seen that website. Thanks for giving us all these amazing ideas! I have a dehydrator I need to dry some lemon slices. I loved the old book turned into the oak leaves too. Wonderful! Thanks for linking to the party! I love your inspirations! What a beautiful and inspiring selection. Love them all!!!! I just became a follower of your beautiful blog. I love Christmas 365 days a year too. That is some serious wreath eye candy. I love them all...makes me want to make a wreath right now! Love it love it love it! This is a fantastic post! I love wreaths AND Christmas! I'd keep Christmas up all year round. Yea, I say that every year but by mid January I get an itch to slowly remove stuff. I'm not one to take it all down at once. It's so sad for me. 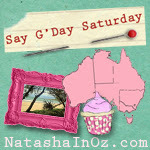 Glad to have found your blog thanks to Holly. They are all beautiful...that blue door is amazing with the green and light blue wreath...stunning. These rock...and you rock for sharing them with us. Love all your wonderful wreaths. Just made a new spring one yesterday out of tulle. Love weaths all year around. Beautiful post!!! Makes me want to go and ...hang a wreath!! So many amazing photos. I wanted to save all of them to look at later. I loved the filled in wreath near the top the best. The rose wreath is so gorgeous. And the yarn wreath made me pause, I have never seen one of those and never imagined they could be done so beautifully. Thanks for passing along all of these lovely photos and for the reminder that wreaths can be for spring and even summer as well as the holidays!